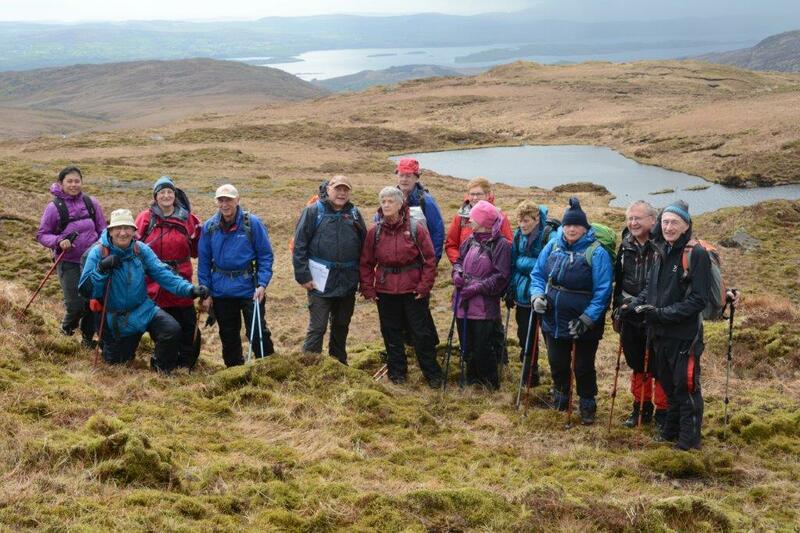 16 CMC members assembled at Ballylickey well before the 11.00 am meeting time, all eager for a good day on the hills. The raindrops appearing on the windscreen of the car on the way down heralded the arrival of the scattering of showers that were forecast for the day ahead. We set off on the dot at 11 on the white-knuckle ride up to the Priest’s Leap with the road ahead sometimes disappearing from view with the rising ground and suddenly re-appearing again as we traversed the hills on the downslope, with overhanging rocks to our right and a steep drop off to our left to the valley below, and absolutely no hard margin on either side. 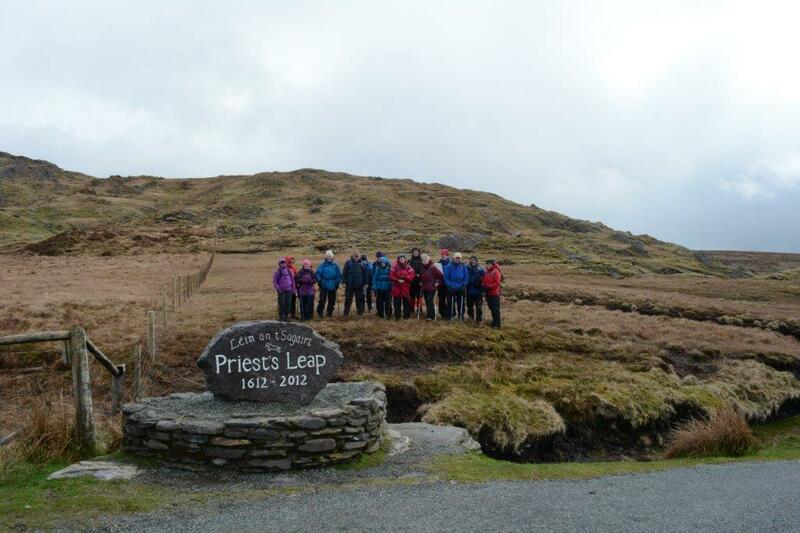 We needn’t have worried about the parking at Priest’s Leap as we were able to fit the five cars comfortably in the limited space available and dislodge the 16 eager walkers. The stiff south-westerly was in our faces at this stage with darkening skies to the south and a bit more brightness to the north. And so, having donned the over-layers, we set off in an easterly direction along the county boundary between Cork and Kerry just after 12 noon. 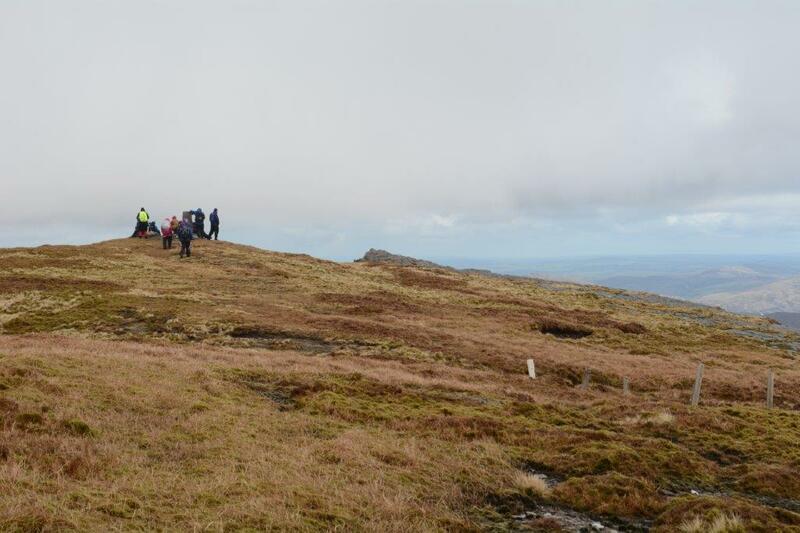 In fact, on this route to Knockboy it is a more or less easterly bearing all the way, with a more northerly turn just before just before Lough Boy and again a north-easterly bearing on the final ascent to Knockboy mountain at 703 metres. And so we continued at a leisurely pace (well, what’s any walk without conversation?) along the county boundary and after a short while we were taking that first turn left with rising terrain ahead affording us an excellent view of Lough Boy to our right, until shortly we were back on an easterly bearing again with Knockboy mountain itself in full view to our left ahead. 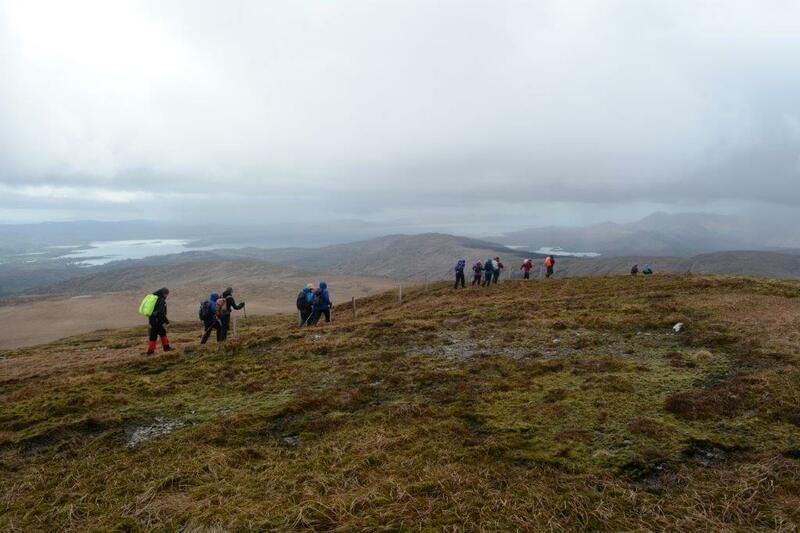 Alas, when we came to our north-easterly turn and final ascent to Knockboy the visibility disappeared and neither the mountain ahead nor the beautiful West Cork coastline was visible from what should otherwise be an excellent vantage point for spectacular views. Well, as it was lunchtime anyway we hunkered down here for the sandwiches, tea – and more conversation . . . and after what seemed like only a short time, the veil of mist that was hanging over West Cork suddenly lifted . . . and soon we could see the full panorama of Bantry Bay, Whiddy Island, the full length of the Sheep’s Head and Mizen Head further away in the distance. Wow! And looking to our left, Knockboy was clearly visible again, so up we got and handrailed the wire fence through undulating terrain, sometimes wet but nobody minded, until finally we arrived at Knockboy summit, the highest point in County Cork, in good visibility with an even fresher south-westerly wind in our faces now. Time to savour the view from the top for a few minutes, take a few photos and relax for a while around the plinth before heading back down again on a reverse track which would take us back to the cars at the Priest’Leap. On the way back, we spotted someone catching up with us from behind who turned out to be another CMC member who had climbed Knockboy from the north side and joined us for the rest of the walk back to the cars. It’s nice to gain one person on a walk – especially if he happens to be a CMC member! He joined us for the white-knuckle ride back and again for the “afters” at a local hostelry. 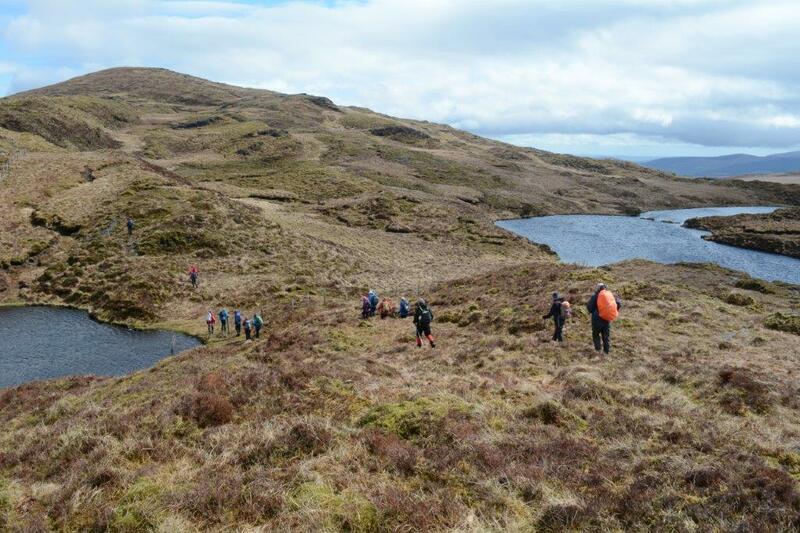 All in all another good day out and was nice to see a mix of all grades of walkers enjoying the day together on Knockboy.